Heaven’s Best Carpet Cleaning Jackson TN offers carpet cleaning, rug cleaning, upholstery cleaning, and more! Our carpet cleaners give you the best value and we are confident that Heaven’s Best Carpet Cleaning Jackson TN is the only carpet cleaning company you need to call to talk to your local carpet cleaning technician to find out which cleaning service is best for you. They can answer your questions and schedule an appointment. Heaven’s Best Jackson has built an outstanding reputation and has been serving customers for 13 years. We utilize a low moisture Dry In 1 Hour process and we also specialize in cleaning investment quality rugs which most of our competitors refer to us. 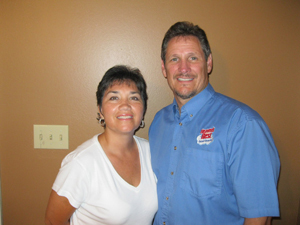 Ed and Tina have been residents of Jackson for 20 years. We started Heaven’s Best in 2003 and after much research, we found a “Dry In 1 Hour” System that actually worked on our own carpet better than many of the other companies we hired only to find that left our carpet soaked and spots that should have come out were still there. We started Heaven’s Best with our network of friends and we started hearing comments such as “my carpets have never looked this good” and “you’ve been able to do what nobody else has done” Heaven’s Best has become a name that our customers have come to know and trust. Trust Heaven’s Best to Get the Job Done! When you schedule your carpet cleaning, rug cleaning, or upholstery cleaning with us, we give you a quote up front. We tell you, the exact time we expect to arrive, and the amount of time we expect the job to take, also upon arrival our clean-cut, uniformed technicians will walk with you and review all spots, stains, and areas of concern that require extra attention. We listen to you let you know what results to expect and before we start we review with you the exact price for the job. With Heaven’s Best Carpet Cleaning Jackson TN, you can expect great quality and value. Heaven's Best did a great job! If you think you need a new carpet let them clean it for you! Mr. Ed is so nice and professional. I have 3 kids and a dog and my carpets look like new again. Promptness, appearance, quality, and price was excellent!! We will call again when we need the excellent work. Carpet looks better than the day we moved in. Excellent!! !